Thank you for taking the time to complete an online review regarding your recent stay at our hotel. On behalf of our entire team, I would like to apologize for failing to exceed your expectations. Your satisfaction is important to us and we will be using the feedback you provided to make improvements to ensure we offer an exceptional experience for our guests in the future. If these issues were truly present and casuing an issue during your stay, please work to notfiy the front desk staff so we can work to correct the issue immediately. We want to ensure that all aspects of any guests stay are met and achived. We spent 7 night's in different night's in Comfort Inns around Utah and Colorado. By far, yours was our most enjoyable night. The pool was great for the kids and hot tub was just right. You have an employee named Alma who went above and beyond her duties. She is a valuable asset to your organization. She helped with all questions including where too eat etc. She has a great personality and is extremely accommodating. Thanks Alma for all your help! Thank you for taking the time to complete our online review regarding your recent stay at our hotel. 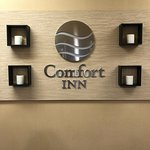 We recently stayed in the Comfort Suites in Fort Collins after the Clarion across the road where we had reservations did not have a room for our handicapped needs. We were going to have a "free" night through the Choice rewards program and this hotel was hardly the 8,000 points we had been quoted for the Clarion, making our night VERY expensive in comparison. We had also reserved a room with "efficiency" facility and this one did not even have a refrigerator (at the $103 level) but Alma, the desk clerk, nicely offered to let us use the employees fridge. We also had TV issues which Alma also was able to fix----it seems the Dish and remote were not working correctly and need to be handled with a "gentle" touch. Besides being very, very angry with the whole situation of having to move out of the Clarion, paying a huge amount and being on a busy street with road construction that kept us from getting out of the hotel and across to the Denny's as planned. We did eat our "picnic" in the room so we did not have food to store even though there was no microwave. The breakfast was probably the best part of the whole stay. They must have been training help as there were three employees standing around getting things for maybe 4 guests at the time we ate. The handicapped facility was exactly as we had expected the Clarion to be and was more than adequate for our needs. Carolyn who was working breakfast was super sweet and helpful! She was a great help with not only breakfast but made excellent suggestions for things to do locally for our daughter who is making 2 years old tomorrow. Carolyn had a very sunshiney personality that was catching. We stayed in a king bed suite on third floor, and it was very nice. The door lock didn't meet the latch, so we used just the chain. The room was great, and I love a bathroom that has plenty of counter space, which this did. I don't like styrofoam at breakfast (just the bowls), and part of the lobby could have small tables and chairs to accommodate the overflow. The staff was all very pleasant, very helpful. Rate was just right for what we had. Natasha went beyond to make me feel welcome and I stay in Foco. Just had friends come visit. Awesome place and I recommend everybody stay here if they come to north Fort Collins!!!!! Give Natasha a raise! !